As the world anxiously awaits the highly anticipated summit between President Donald Trump and North Korean dictator Kim Jong Un in Singapore next week, White House National Security Advisor John Bolton and Secretary of State Mike Pompeo have been working closely together in preparation for the big meeting. According to State Department spokesperson Heather Nauert, Pompeo and Bolton had breakfast Thursday morning in Washington D.C. and briefed President Trump together yesterday at the White House. “We have been working very closely with the NSC in advance of the summit, in particular with Ambassador Bolton’s office. That’s something we would typically do because to pull together a summit of this nature between two principles, the president and also Chairman Kim, requires a ton of work: logistical work, policy work, all of that. State Department and NSC, specifically Ambassador Bolton and State, have been working very closely together,” Nauert told Townhall. 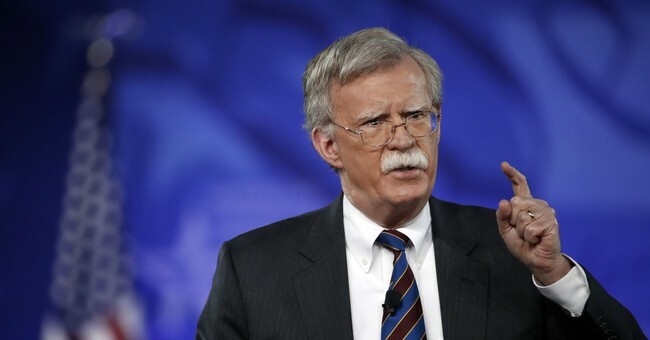 Over at the National Security Council, Bolton has been busy gathering the best intelligence from all relevant federal government agencies in preparation for the summit. He's also held a series of regular meetings with NSC staff and has regularly briefed President Trump with his best information. Although the Singapore summit will mark President Trump’s first meeting with Kim Jong Un, Secretary Pompeo has met with him twice. Last week Pompeo engaged in a series of discussions with Chairman Un's right-hand man and North Korean spy chief Kim Yong Chol in New York City. After those meetings, Chol delivered a letter from Chairman Un to President Trump in the Oval Office on Friday. President Trump will meet with Japanese Prime Minister Shinzo Abe at the White House Thursday ahead of the G7 Summit in Montreal. He will then travel to Singapore for the summit with North Korean leader Kim Jong Un, which will be held at on Sentosa Island. Editor’s note: A previous version of this story stated Garrett Marquis is a special advisor to President Trump. That is incorrect. Marquis is a special assistant to President Trump. We regret the error.